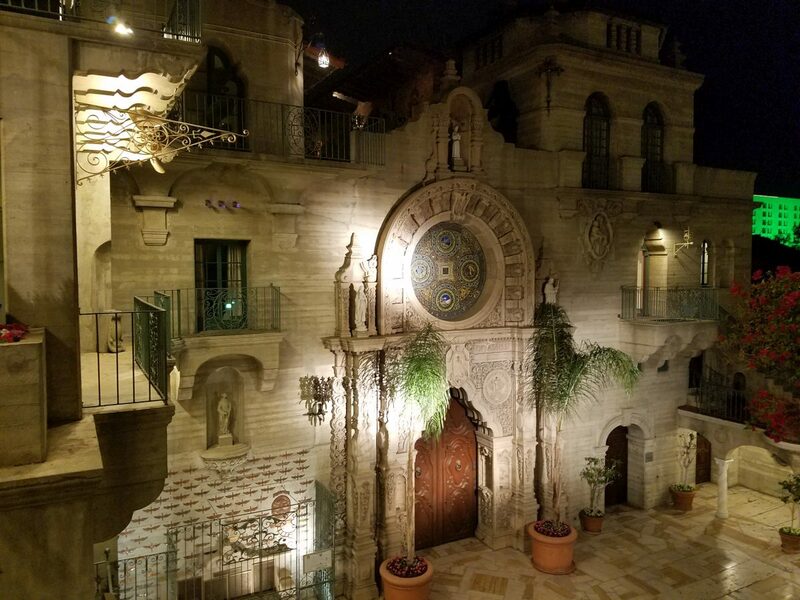 The Historic Mission Inn, Riverside, was the official conference hotel. The 2016 California Trails and Greenways conference was held in historic downtown Riverside from April 7 – 10, 2016. The conference theme was “loving our trails to death,” something many long-time trail users are realizing is becoming the norm, not the exception. This is especially true on our crowded and increasingly popular trails in the Greater Los Angeles Area. Steve Messer, CORBA’s President, was on hand. Laurel Harkness, IMBA’s California Regional Director, had a booth and gave a presentation on “providing great, sustainable trail experiences. 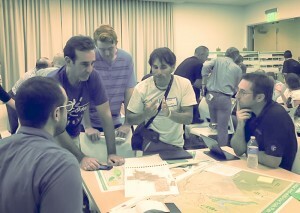 IMBA chapters from Orange County, San Diego County, Folsom, and the Central Coast were also represented. We took the opportunity to get the IMBA chapters together for an update on issues, strategies, and directions for each of the chapters. The conference is also a great way to network with land managers, decision makers, trail professionals, and other user group advocates. In the six years that I’ve been attending these conferences, it’s becoming increasingly apparent that Mountain Bikers are, more and more, being considered a legitimate and valuable contributors to the trail user community. With more IMBA chapters attending, and many presentations by mountain bikers and mountain-bike-friendly land managers and professionals, its obvious we are here to stay. As a great example of the improving relations with the trail community, Steve Messer teamed up with the California State Horsemen’s Association, Trails4All, Riverside County Backcountry Horsemen and the Santa Monica Mountains Trails Council to give a presentation on trail etiquette best practices. The presentation was well-received, but it was apparent we were “preaching to the choir.” The last slide of the presentation actually thanked the choir for listening to us preach! 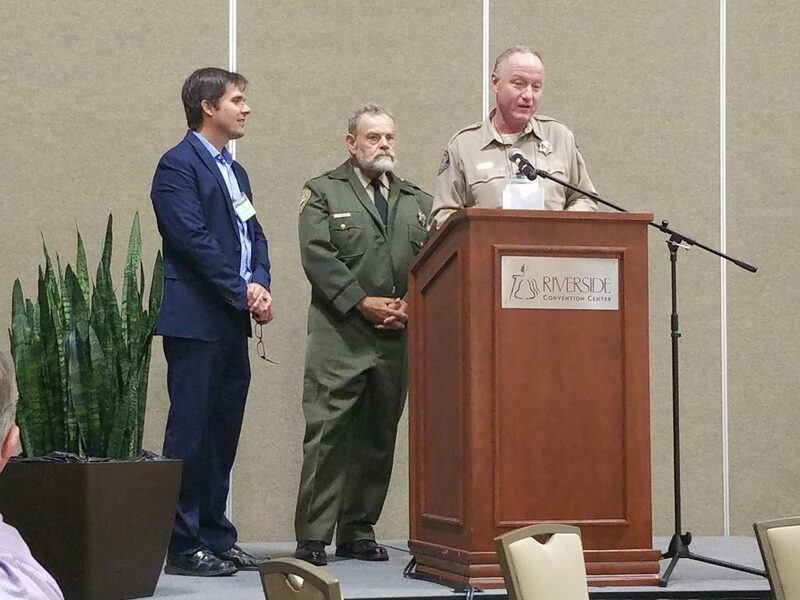 During the presentation, Dale Skinner, State Park Trails Manager for the Angeles District (Santa Monica Mountains), gave Steve and CORBA kudos for our approach to providing solutions and being exemplary stewards of our trails. 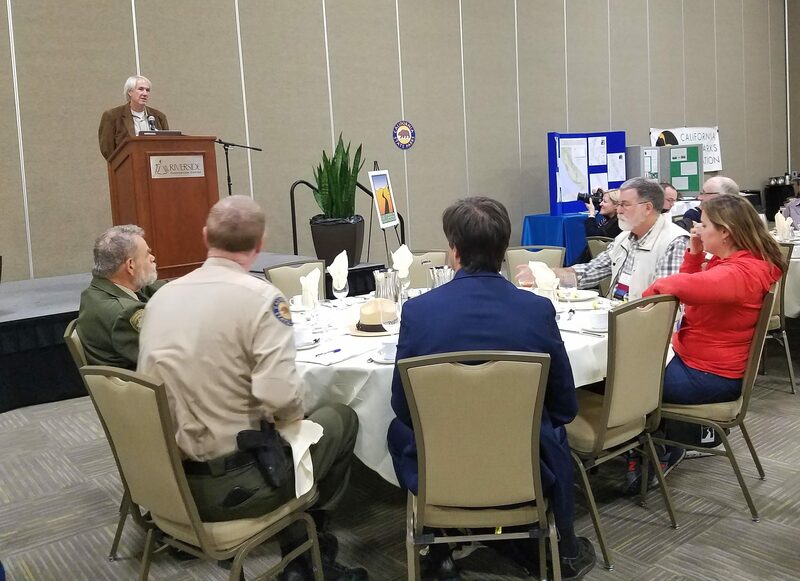 Another important presentation was Thursday’s lunch time plenary by Santa Monica Mountains National Recreation Area superintendent David Szymanski, State Parks Angeles District Superintendent Craig Sap, and Santa Monica Mountains Conservency executive director Joe Edmiston. They discussed the current status of the Backbone Trail, and the 65 years it has taken to bring a 65 mile trail from concept to completion. Currently there are two incomplete segments. One is the bypass around the gates at the west end of Etz Meloy motorway. The NPS has begun construction on a re-route that will bypass the closed gates. It’s constrained by a narrow easement from the private property owners, forcing a less-than-ideal alignment, but it will be much better than a closed segment of trail and no alternative. The other outstanding issue is a private parcel owned by former governer Arnold Schwarzenneger, west of Kanan. The NPS is hoping to secure a trail easement from Schwarzenneger and his partners soon. During the talk Craig Sap gave a noteworthy shoutout to CORBA and to the Santa Monica Mountains Trails Council for our contributions to keeping the trails in good shape, and making up for some of the agency’s deficiencies with their reduced budgets. They hope to open the complete Backbone trail on June 4th, as part of National Trails Day. They also plan to submit the trail for inclusion in the National Recreation Trail system. We believe the trail is worthy of such recognition. Other notable presentations were from Rick Gunn who rode a bike around the world. Not only was he an amazing storyteller, he had an amazing story to tell. As a former journalist and photographer, his photography and the range of emotional lows and highs he experienced over two years had all the conference attendees in silence, awe, and at times, even in tears. Aside from the State Parks employee training, for which they get continuing education credit, the sessions covered a range of topics, from sustainable trail building, trail surveying, working with public-private partnerships, and a number of project-specific presentations. Project specific presentations were given on the current status of the Castaic Trail Master Plan, the LA River Trail (bike path), and a number of other project-related presentations. There were presentation by the Backcountry Horsemen on how they can assist in trail maintenance by packing in tools and supplies. After the conference sessions were completed, a group headed out for the traditional multi-use ride/hike/bike event. 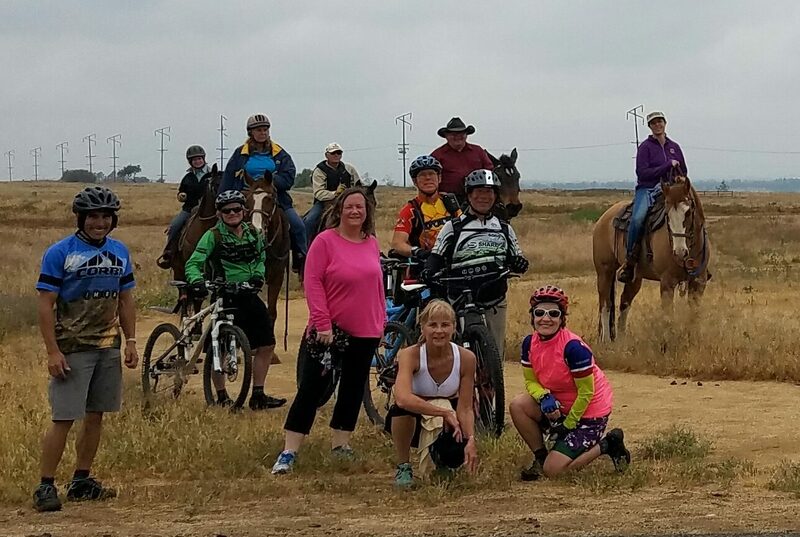 Local equestrians, mountain bikers and hikers converged on the Santa Ana River Trail to ride/hike together, as an expression of solidarity and multi-use cooperation. Each year we look forward to participating in this increasingly useful and relevant conference. 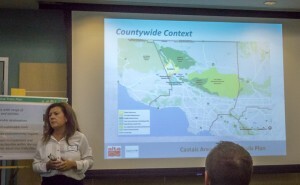 It covers issues unique to California, is attended by both land managers, conservancies, trail advocates and user groups. It brings everyone together, simply for a passion for trails. We are loking forward to next year, to be held in Monterey about the same time as Sea Otter. CORBA’s monthly board of directors meetings are open to the public. We welcome and value our members’ input at these meetings. For the months of May and June 2015, CORBA’s Board of Director’s monthly meeting has been moved from the fourth Monday of the month to the corresponding Wednesday. In an effort to make it easier for people to attend, we are holding these monthly meetings at various bike shops and businesses in our territory. Chances are there will be a meeting somewhere near you sometime this year. If there’s an issue you’d like to bring up but are unable to attend, feel free to email us the week prior to the meeting so it can be placed on the agenda. Our meeting and event schedule is available at http://meetup.com/corbamtb. We greatly appreciate our bike shop partners for hosting our monthly meetings and for their support. Wednesday, May 26, 6 – 8 p.m.
Wednesday, June 24, 6 – 8 p.m.
Monday, July 27, 6 – 8 p.m.
Monday, August 24, 6 – 8 p.m.
Did you know that CORBA’s monthly Board of Directors meeting is open to our members and supporters? We’d love to hear from you, and give you the opportunity to learn first-hand what’s going on at CORBA. This year we are doing things a little differently. Since our territory is so large, we have begun rotating locations to give more people an opportunity to join us. Meetings are posted at http://meetup.com/corbamtb, alongside our trailwork events, group rides, and other activities. You can RSVP there or by email to info@corbamtb.com. RSVP’s are recommended, as some of our meeting locations have limited seating. If you’re unable to attend, but would like to tell us something, you can always email us beforehand at info@corbamtb.com. Meetings are held on the fourth Monday of each month at 6 p.m. This month we’ll be meeting at REI in Santa Monica. 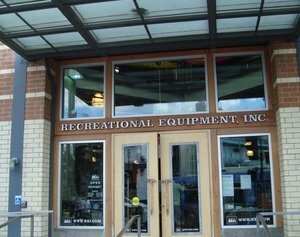 We thank REI for their ongoing support of CORBA. When: Monday, March 23, 6 p.m. – 8 p.m.